Leonardo da Vinci International Airport also known as Fiumicino International Airport, is Italy's largest airport, with over 29 million passengers per year. It was opened in stages between 1956 and 1961 and it has since undergone several expansion works. It is located in Fiumicino and serves Rome. The airport is completely non-smoking. It is one of two hubs of the Italian flag carrier Alitalia along with Milan-Malpensa International Airport. Leonardo da Vinci is about 29 kilometers (18 miles) by car from Rome's historic city center, and cab rides can be expensive. 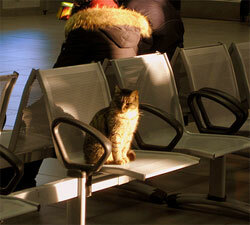 Train service is available at the airport terminal. Car - Leonardo da Vinci airport is only 32 km away from the centre of Rome and it's easily reacheable by car through the Rome-Fiumicino motorway. In the airport there is a service of attended parking. Rome Airport Private Arrival Transfer - Book an arrival transfer in Rome and you will be met and transferred conveniently to your Rome city hotel. This makes it so much easier when you arrive, especially if you are new to the city. So pre-book your transfer today and enjoy a smooth start to your vacation! Rome Airport Private Departure Transfer - Booking a departure transfer means you will be picked up from your hotel for a smooth journey to the airport. Travel in the quiet comfort of a private car. It's easy and the best part is that you'll be able to enjoy your last moments in Rome without stress. BOOK NOW! Rome Fiumicino Airport Arrival Shuttle Transfer - This shuttle service will take you from Rome's Leonardo Da Vinci (Fiumicino) International Airport to your Rome city hotel, without the hassle of picking up a rental car, negotiating unfamiliar traffic and maps. Take the easy way - book this efficient service online now and save time at your destination! Rome Fiumicino Airport Departure Shuttle Transfer - Need to get to Rome's Leonardo Da Vinci (Fiumicino) International Airport? 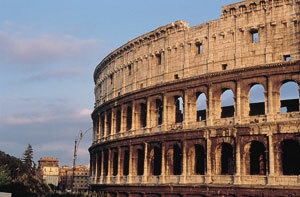 Plan your trip ahead of time, and book your airport transfer from your Rome hotel right here. Arrive at the airport on time, relaxed and with money in your pocket! Fiumicino <-> Rome by taxi - pay attention: use only authorised taxis (white vehicles with a taximeter) available at the arrivals areas of each terminal. Fiumicino <-> Rome by train: Outside the airport there is a little train station with direct connection to Roma Termini. Train makes no mid-journey stops. Car Hire - Rent a car: Are you searching for information about renting a car in Rome? If yes, you found the right site! Thanks to Aboutroma.com and Avis you can rent a car to be pick up at your arrival, directly online. Offices are located at the Domestic and International Arrival Halls, just follow the Rent a Car signs. SHUTTLE BUS - The Shuttle bus, which links the Long Stay car park to Arrivals and Departures Terminals A, B and C, is a free of charge courtesy service operating every 20 minutes within 24 h.
Ciampino Airport (Italian: Aeroporto di Roma-Ciampino) or Giovan Battista Pastine Airport is a joint, besides an important civilian, commercial and military airport near to Rome, in Italy. It formerly served as a military airbase until it was opened by the Italian government to commercial air traffic with the introduction of Ryanair and Icelandair service. 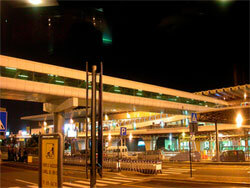 Ciampino Airport became a popular alternative to the heavily congested Leonardo Da Vinci International Airport. Terravision Low Cost Express Coach - A coach service run by Terravision leaves from the Air Terminal to/from Roma Termini, the Central Train Station situated in the city center of Rome. Thanks to the partnership with Terravision, now you can book directly with us your express low-cost airport transfer to/from Rome Ciampino Airport direct to/from Roma Termini Central Station. Journey Time: 40 mins (estimated times). Departs from: Buses depart from Ciampino city centre, go to Ciampino airport, then directly to Termini. Departure time: Buses - all connected with the airport's flights - leave every 30 minutes. Ciampino <-> Rome by taxi - pay attention: use only authorised taxis (white vehicles with a taximeter) available at the arrivals areas of each terminal.